So let's start on the virtual tour of our new apartment...which we absolutely love. It's in Dublin, California. Which is about 40 minutes outside of San Francisco. It's on the east bay, just southeast a little bit. We're only 5-10 minutes away from everything: Walmart, Target, Bed Bath and Beyond, 3 malls, 2 In-and-Out Burgers, Home Depot, like 10 high schools, the freeway, my Aunt and Uncle Johansen, our church, the movie theater (which we won't be going to--$10.50 per person), Iron Horse Trail, the Post Office, and 50 different parks. No joke, 50--10 in Dublin and 40 in Pleasanton (neighbor city). Our sweet new table. We were debating for a while on what size we should get, and we really liked a smaller 47" one...but then we thought we should get this one, a 72" one that has a leaf to expand to 84" and with 6 chairs instead of 4. This way, we can have more than one couple over and we plan on keeping this one for a long time. Again, curtains--Walmart clearance. I put the flowers together on the table. Walmart is taking over the world. And we're helping. The laundry in the hall closet! Oh this is heavenly to have so close and convenient. So nice. Our bedroom. The room that's not finished yet. We have some pictures to still put up above the bed, and we need to get an office desk in here...we're working on it. And back outside, as you come out the door and turn directly and immediately right, we have a big nice park! Right across the street! Here is the pool. Sweet huh? It's nice. There's a hot tub and tennis and basketball courts. And also a big workout gym right behind us in this picture...which Ben and I have faithfully used the last 2 days in a row! So this is where we spend our time, out in the sun at the pool, reading, being lazy. Quite the spoiled life for now. We're quite bored of each other and can't wait till he starts work in 2 weeks. Our first weekend here in Dublin, my family was out to go to my cousin's wedding reception (who lives close) and to see us. It was so fun to have them here with us! (Especially since we didn't have ANYTHING for a few days). We did the reception at my Aunt and Uncle's, went to church together, watched the Olympics at their place, and then Monday we all drove down to Monterey Bay to go to the huge Aquarium they have there. It was awesome! They had these huge frames with these jellyfish aquariums in them! Tom--you need this for your house as a wall decoration! Then we drove out to Carmel on the "17-mile road." 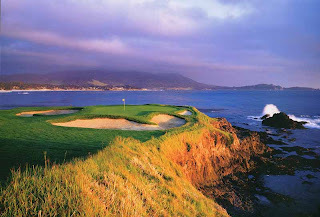 This is a scenic drive that wraps through Pebble Beach Golf Course and millionare mansions along the way. It was incredible! The houses were breath-taking and the golf course made Ben want to cry:) Jk. We stopped for a while at one of the beaches and explored, found crabs and star fish. There were hundreds of birds and all these sea lions out on the rocks barking and splashing around--it was so cool! It's not often you get to see a living being that's 250 years old. This famous tree, the Lone Cypress, was a sapling when California was a Spanish colony in the mid 18th century. And still today, there it is, standing tall. Cool huh? Well we got our stuff! It came Wednesday and we've just been trying to get everything settled and unpacked. I got really sick Wed night and am just getting worse and worse so it's been going pretty slow. We've been unpacking, watching movies, reading, and laying out by the pool everyday. The movers broke our TV, they must have dropped it because it has a huge crack in it and half the screen is bright red and some is green...ah! Annoying. They refund 60cents per pound...so we're just lucky it's such a huge heavy tv:) They also lost 2 boxes and we have no idea what was in them (which is a good thing right now--otherwise we'd be freaking out more). They say they're "working on it." So whatever--moving is never fun and we just have to deal with it right!? Hope all is well! Updates and pictures as soon as we get settled! We've officially moved to California! And we couldn't be more excited. But we could be a little more happy. Our moving van came last Wednesday to pick up all our stuff, and they did a great job! We were really impressed. Multiple people at New Planet Moving and Storage told us that our stuff would be to us on Saturday morning, that it only takes 2 to 3 days. So we rushed down Friday to be there when they came Saturday morning. Well, we got here Friday night at around 7pm and the office to our apartment complex had closed early at 5:30pm, so we couldn't get our keys! We had to stay at a hotel right by our place. Pretty annoying. Then Saturday morning came and we got no call telling us they were on their way. We didn't get a call Sunday either and all their offices and supposedly "24-customer service" lines went to an answering machine. At this point we were wondering if we'd find our stuff for sale on ebay! Luckily, instead of being bored in our empty apartment with only a blow-up mattress and no extra underwear, my whole family was down with us for my cousin's wedding reception. It was really fun to have them down here and have them see our apartment and hang out. They left last night :( SO yesterday we called them all day, starting at 8am and all they would say was, "Our dispatcher is working on it, we'll get back to you" over and over. I called at 4:30pm and said, "You still haven't called us! All we want to know is where our stuff is and when it is coming!" And they said "Ma'am, we'll call you back before the 'end of the day,'" whatever that means. No call. We kept calling and just got their answering machine. I called this morning and was pretty mad and the guy said, "You'll have to wait till the dispatcher is in the office" and I said "When does he come in?" and he said, "Whenever he feels like it." Give me a break! Are you kidding me?! OH man. Never get these guys to move you. So I just barely called back and they said it's coming tomorrow and the guy will call us today to let us know what time. Oh brother. So, keep your fingers crossed for us that it actually comes. A week later. So annoying. BUT the great news is that we LOVE our place!! It's so nice and we can't wait to get settled. The community is so great too. We'll post pictures soon. There are so many trees and we're RIGHT next to a huge nice park, and Iron Horse Trail (a 25 mile trail) runs right by our place. It's so nice, we're so glad we chose this place. A couple of weeks ago, we went to Vegas for a weekend celebration of both Ben's grandparent's 80th birthdays. It was so much fun to see all of the family again. Especially sweet little Sitty (she's from Lebanon, this means "Grandma"). We ate lots and lots of great food, played games, went shopping, and had this great special dinner with everyone Saturday night. I was the only one who ordered the "Lemon-pepper chicken." It was the WHOLE chicken!! Not just the breast with some mashed potatoes....it was the whole thing. Wow. This is the dress I had made for me in Thailand--cute huh?! Sweet Sitty has been fighting cancer since last fall. She's doing great though! Thanks Grandad and Sitty for a great Garrison weekend! We love you guys! We had a McCleary side "good-bye to me and Ben" get-together last week and it was so fun! Kraig is great friends with Elder Ron Rasband of the Seventy and he owns about 200 acres up by Kamas. It's absolutely beautiful up there and he lets us use it sometimes. So we went up and 4-wheeled, fished, and grilled. Lisa was catching all the fish. She was quite the fish queen! I finally caught two. They were the biggest of the day! We've been having tons of fun! Fishing, playing, helping unpack my parents, pack ourselves up, I'm doing lots of weddings, etc. We leave in 4 days and I can't believe it! We're totally excited and ready though. 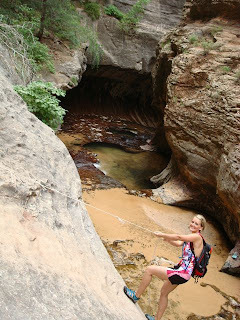 Over the past weekend we went down to Zions to hike "The Subway" with our favorite family David and Janelle Phipps and their darling little girl Hazel. This was Ben's 3rd time so he knew what we were in for and had loved it both times before. Subway is the upper part of The Narrows and takes about 8 hours. We spent the night in Cedar City at Janelle's mom's place and then friday morning, we left Hazel behind with her Grandma and took off for the Subway. It was the most amazing hike I've ever been on in my life! 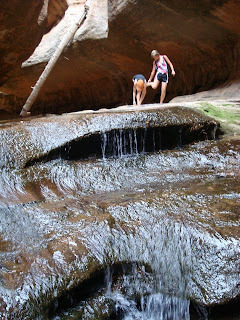 Everything was perfect, the weather, the scenery, the company, the canyons and water. We lost sight of the trail a couple of times which added some time to our hike but the second time we kind of came to a dead end at the edge of a cliff and we knew we had to get down to the bottom of the canyon somehow. We could hear and see the water down below, but we were on a cliff that was too steep to descend. David and Janelle were hanging on to a steep ledge, trying to decide if they could use the rope and go for it while Ben was off looking for a better way to get down. He started to slip on some lose rocks and caught himself with a cactus! Poor man, he had hundreds of stickers in his palm and somehow on his bum! I meanwhile was trying everything not to wet my pants waiting for them to decide what to do. We were in quite a predicament. After much thought, we finally decided to go back (which wasn't easy at all) and find another route. Which was great because we found a much easier way down. 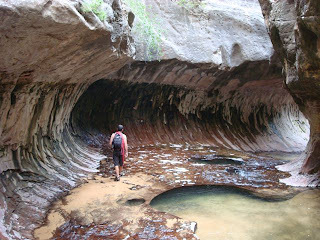 Finally, we were off the hot sandstone out in the open and we were down in the slot canyons. This part was so cool. We had to swim and tred with our bags above our heads in the freezing water! But it felt SO good and was so refreshing to get wet. A couple of times we had to repel with some rope we brought. This one was pretty scary I don't know why but it descended pretty gradually and then all of a sudden got so steep you couldn't see over the edge. It was all arm strength! 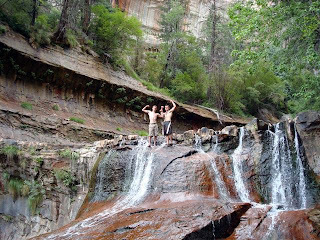 Ben and Dave went down this waterfall on their bums. It was so funny. It was quite a drop at the beginning as you can see, and their faces instantly changed from joy to "OUCH!" as they zoomed all the way down. SO funny. This part was one of the funniest of the whole hikes. We had finished a swimming part and I was carrying Dave's bag. It was shallow, only up to our thighs and Ben said "I think we're done with the swimming part for now" and suddenly my next step, I was GONE! I went completely under water! Dave said he saw it and as soon as I disappeared my left hand shot right up with the bag and I was totally underwater. I couldn't even touch! I was treading and threw the bag at Ben and found my footing again. It was hilarious. Sweet save!! Janelle and I had to keep switching shoes because we had such big blisters. It was horrible. Especially at the end when it was switchbacks uphill after 9 hours of hiking. We were so pooped. We went to Subway and each ate a footlong and some fries. So good. We hiked until about 8:30 that night and we were toast for the rest of the weekend. We had planned on camping that night and hiking Angel's Landing the next day, but our muscles were shot and our feet were covered in blisters, so we went back to Janelle's mom's and did nothing all day Saturday but eat junk food, play Settler's and watch movies in the most amazing theatre room ever. It was a fantastic weekend.